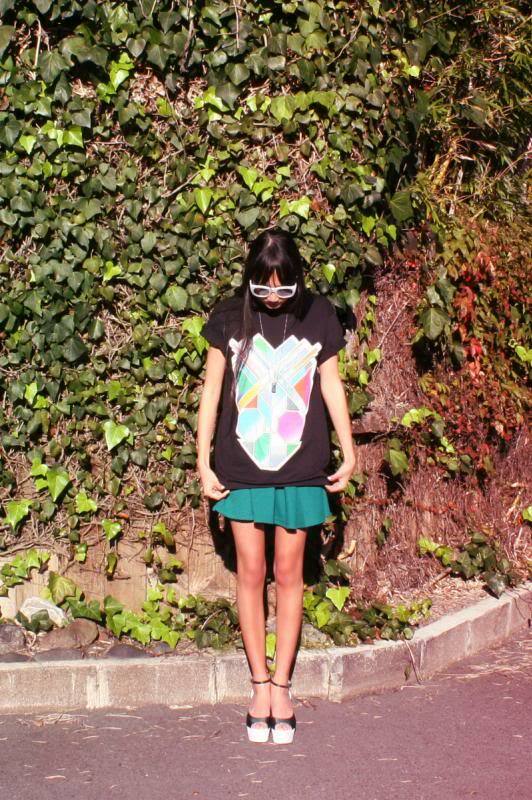 Topshop x Jonathan Saunders tee, Asos skirt and rings, Celine heels, Le Specs sunglasses, vintage necklace. So I reverted back to 6 year old me and got bangs. It was time for a transformation without being too drastic, and I've never dyed my hair (and never plan to) so a cut was my only option. I went to a beautiful salon in Ponsonby called D&M, after scouring similar places in the area. Admittedly I picked them because they have Rachel Hunter and Xena, Warrior Princess, as regular customers (how unabashedly shallow of me). The amazing stylist Kerrie took me through different options and ultimately we decided to go for a blunt fringe with the option of side-sweeping for a '60s vibe. Then I thought, let's debut my new 'do with my new shoes! During my Melbourne trip in April, I "stumbled" across a Miss Louise sale. These Celine babies could have set me back to the middle ages, but they ended up being quite the steal. The glass casing I plan to have built to showcase them will probably cost more than the shoes themselves. P.S. Due to events beyond our control, we have to keep our special collab announcement a secret just a little while longer! In the meantime, please head over to ASOS State of Fashion and vote for our looks under the VIC banner! While you're there, why not upload your own looks to be in the running to win a $1000 wardrobe!